The motto of Chippewa Valley Tours is &apos;Food, Culture, Fun&apos; and that&apos;s exactly what you get when attending one of their tours. Owned and operated by Three Foodies, LLC, Chippewa Valley Tours is a new type of tour company in the area, and the first of it&apos;s kind. If their premiere Downtown Eau Claire Food & History Tour is any indication of things to come, the company has a very bright future ahead! Held on Saturdays from May through the end of September, the Downtown Eau Claire Food & History Tour meets at 1:30 pm just outside of The Local Store. The cost is $65.00 per person, and tickets can be purchased online at www.chippewavalleytours.com, where you&apos;ll also find FAQs about the tour and bios of the Three Foodies. I was fortunate to get to participate in the first tour of the season, with Michelle, one of the Three Foodies, as our guide. Michelle shared with us interesting facts about the history of each stop on the tour and of several other places along the approximately 1.2-mile route. The tour itself takes about three hours, with 15-20 minutes allotted at each location. After introductions and some history on The Local Store, we went right across the street to The Lakely restaurant, part of The Oxbow Hotel. Once settled in the beautiful outdoor seating area at The Lakely, we were served their Koldtboard appetizer. A nod to Scandinavian heritage in the area, the Koldtboard is an impressive array of cheeses, meats, and relishes. 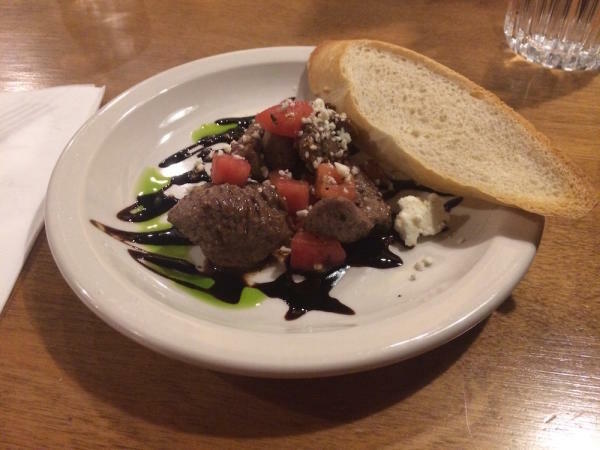 A farm-to-table restaurant, most of the items are sourced locally or prepared in-house. This was a fantastic kick-off to the tour, made even better with a half serving of the House Old Fashioned alongside! The next stop was Northbound Supply Co. on Barstow Street. It has all the specialty outdoor gear you need, an amazing coffee bar, and owners and staff that are extremely knowledgeable about both. This was my first time at Northbound Supply Co., and it will not be the last! Our tasting here was a coffee drink of our choice. I chose the Coconaut, featuring cold brew coffee, coconut syrup, and chocolate drizzle. One of my fellow tourists chose Purple Rain, an iced tea and citrus drink that for me would have almost been too pretty to drink! 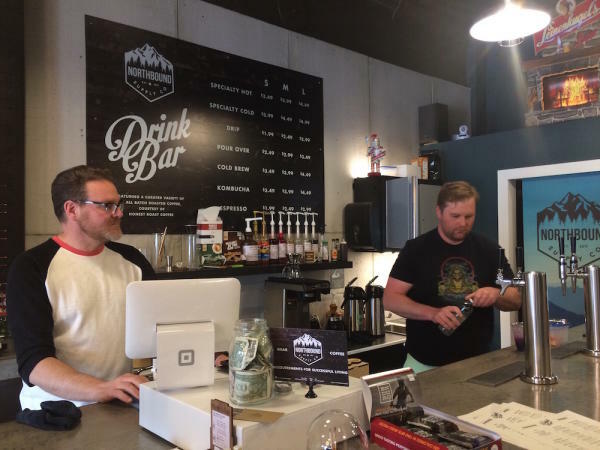 After a browse around the store, we took our drinks to-go on a walk through Phoenix Park, with even more history on the city of Eau Claire, the Phoenix Park site, and the confluence of the Eau Claire and Chippewa Rivers, and what the area means to Downtown. Then it was on to The Informalist, located at The Lismore hotel. At The Informalist, we had the opportunity to talk with Head Chef Joseph about what we were sampling that day and what he envisions for the future of The Informalist. He&apos;s very passionate about what he does, and it came through in our conversation and in the food. We sampled a salad made of thin ribbons of beets and sweet potatoes, with a citrus dressing. It was so refreshing, just the thing we needed after the humid walk from Phoenix Park. Next up was a sampling of three variations on a Morel mushroom appetizer, including ones stuffed with a bechamel sauce, breaded with panko, and fried. 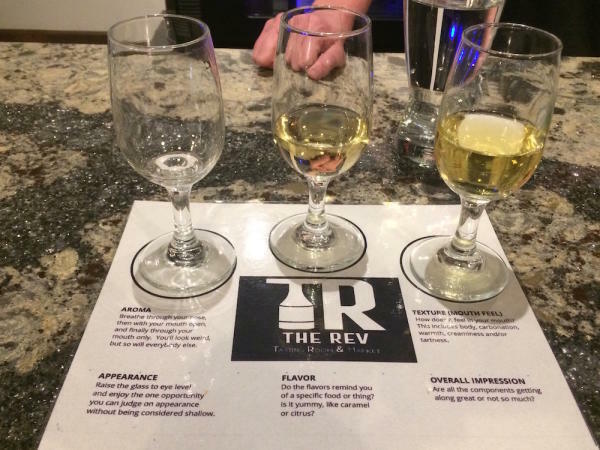 Moving onto the newest of businesses featured on the tour, our next stop was The Rev (short for The Revolutionary). Owned by Benny Haas, proprietor of The Plus and The Metro, also located in Downtown Eau Claire, The Rev is a new wine bar featuring East and West Coast wines and a tapas menu, that gives customers the feeling of being in another city with a taste of something different, still served with Midwest hospitality. The decor is sleek and modern, but also comfortable and cozy. It&apos;s a great place to stop in for a glass of wine and a snack before a show next door at The Plus. We had the opportunity to try a flight of delicious red or white wines. Next, it was on down Barstow St. to Houligans, one of Eau Claire&apos;s favorite fine dining destinations. There we were served the popular steak bites appetizer, drizzled in a balsamic reduction and sprinkled with Gorgonzola cheese. Last, but not least, it was time for dessert at our final stop on the tour, Ramone&apos;s Ice Cream Parlor. 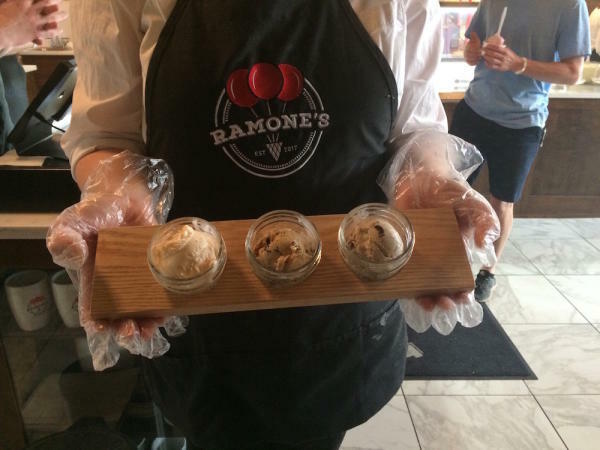 Ramone&apos;s served something I had never experienced before-an ice cream flight! It consisted of three small Mason jars full of different ice cream flavors. We were given my two favorites: Ultimate Oreo and This Just Got Serious, and a new flavor to me, a seasonal Peach ice cream. Very tasty, and just the right amount to top off the tour on a sweet note! 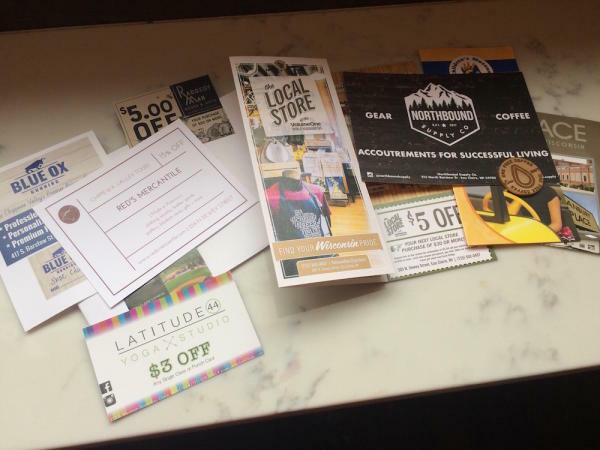 To conclude the tour, Michelle surprised us with an envelope full of coupons and information on not only the businesses we had visited but others in Downtown Eau Claire! What an excellent incentive to explore even more of what Downtown has to offer. The Downtown Eau Claire Food & History Tour is just the beginning of what The Three Foodies will have to offer. Plans are in motion for future tours, including a haunted tour, progressive dinners, a Food & History Tour of Downtown Chippewa Falls, and of Water St. in Eau Claire. Share with us your experiences and favorite food and drink when you take the Downtown Eau Claire Food & History Tour! Don&apos;t forget to tag your posts #CaptureEC and #foodculturefun!